Temporomandibular Joint Syndrome (TMJ) - body, causes, What Is TMJ? Temporomandibular (tem-po-roman-DIB-yoo-lar) joint syndrome refers to symptoms caused by problems with the joint that joins the jawbone to the skull. 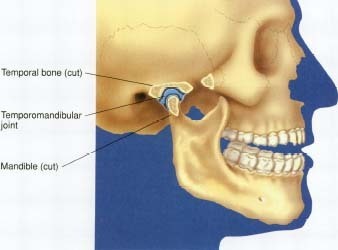 Side view of a temporomandibular joint. skull. Each temporomandibular joint acts as both a hinge and a gliding joint; they allow the jaw to open and to slide from side to side. TMJ also refers to temporomandibular joint syndrome (or disorder), in which the joints do not function properly. This may cause pain, difficulty opening and closing the mouth easily, or problems with chewing and swallowing, as well as other symptoms. TMJ can be caused by dislocated temporomandibular joints or by inherited problems with the joints. In a condition called bruxism (BRUK-siz-um), some people grind their teeth during sleep or times of stress, which can lead to TMJ. Malocclusion (mal-o-KLOO-zhun), when teeth do not fit together properly; whiplash injuries * from car accidents; being hit on the head or jaw; and arthritis * are other causes of TMJ. Doctors or dentists will ask the patient to describe the symptoms and will then examine the patient. Sometimes, x-rays and MRIs * are used to examine the joints to diagnose TMJ. Hot compresses and over-the-counter pain medications may help relieve TMJ. Stress management and mouth guards worn at night can help eliminate teeth grinding and its effects. * whiplash injuries describe general injuries to the spine and spinal cord at the junction of the fourth and fifth vertebrae (VER-te-bray) in the neck occurring as a result of rapid acceleration or deceleration of the body. * arthritis (ar-THRY-tis) refers to any of several disorders characterized by inflammation (in-fla-MAY-shun) of the joints. The National Institute of Dental and Craniofacial Research (NIDCR), part of the U.S. National Institutes of Health (NIH), posts information about TMJ on its website. TMJ Association, Ltd., PO. Box 26770, Milwaukee, WI 53226-0770. The TMJ Association provides information and support for people who have TMJ. Jaw Joints and Allied Musculo-Skeletal Disorders Foundation, Inc. (JJAMD), Forsyth Dental Research Center, 140 Fenway, Boston, MA 02115-3799. This organization, founded in 1982, provides information and support for people with TMJ.